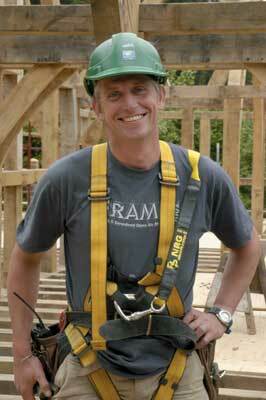 Erecting large oak frames is a skilled job and should only be undertaken by fully trained personnel! 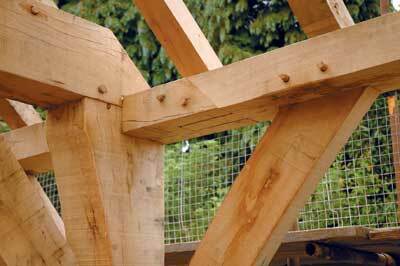 Green-oak (Quercus robur) framing is a method of making a structural frame that will support both the roof and the floors of a building and on which the external envelope can be hung. The beams within the frame are connected using traditional joints and secured with wooden pegs. In North America this method would simply be known as 'timber framing' but unfortunately in Britain this generally means houses built with 100 x 50mm softwood, nailed together. To distinguish 'heavy' structural timber framing from 'light' softwood timber framing, 'oak' tends to be included somewhere in its description. 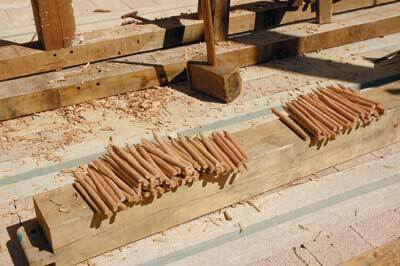 Scribe rule involves laying up each plane of the building in its exact position. This is achieved by stacking the members of a particular frame on top of each other and then transcribing the positions of the joints. The basic principle of scribe rule is that it assumes that each piece of timber is not perfectly square and straight, so by laying out a frame full size, allowances can be made for the irregularity of the timber. To be able to stack the timbers accurately careful reference lines and marks have to be first put on each member. Because most timbers within the frame will be bowing and/or twisted to some extent, these reference lines need to refer to a constant theoretical grid throughout the building. This is where the idea of perfectly flat planes, which bisect the building, comes in very useful. The bends or twists in the timber can move in or out of these planes but the overall geometry will remain constant. The reference lines and level marks placed on the timbers help to describe these imaginary planes, which in turn enable the carpenter to construct the frame accurately. 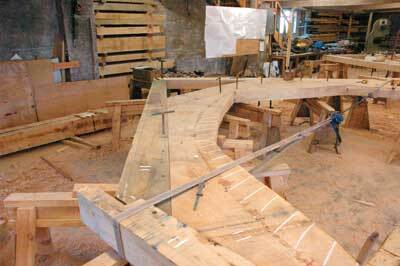 To further assist the carpenter, the planes should coincide with the main setting out points of the complete frame. Where these planes cross on the outside of the frame they form origin points or nodes, which in turn can be used to construct a grid on which the building itself can be laid out. The main setting out dimensions of the frame therefore remain constant, and are not subject to any wanderings the timber may be experiencing. This grid is also reflected in the dimensions placed on the working drawings, so for instance a dimension will go from one reference face to another. If the dimensions were put between the timbers discrepancies would creep in because the timbers are never sawn exactly the size that they are marked on the drawings. The critical timbers to be referenced are the ones that are common to more than one reference plane. These are called primary timbers, whereas the ones that are common to only one plane are called secondary timbers. Working to a particular plane means that all the timbers which are part of it have to be referenced and orientated according to that plane. This is done by adding a face mark on the main side, and a face-edge mark on an adjacent side. When the timbers are laid out in the workshop during a frame lay-up, the chosen 'face side', as it is known, is always uppermost on the trestles. In order to face the timbers correctly, they are laid out on trestles and are examined for any defects. These can include structural defects, such as knots, especially where joints may intersect, and any twist or bow. 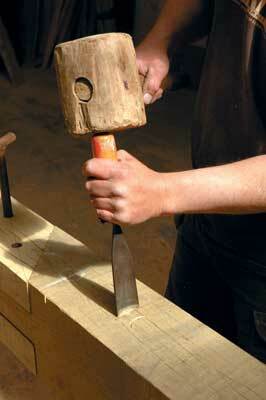 The orientation of the heart is also examined, as its position is likely to affect the shape of the timber. Beams tend to bow up on the heart side of the timber because of the tension released within the wood at the time of sawing. Even within boxed-heart timbers, the heart rarely runs straight and true through the middle, and consequently bows and twists are produced. 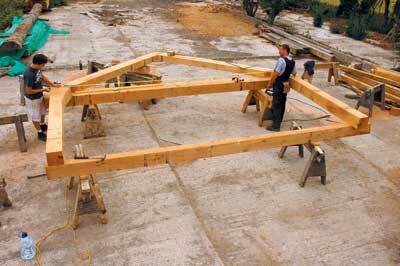 Once the timbers in a section of frame have been faced, they can be orientated roughly into position. To be able to set them out and scribe them accurately, these timbers need to have reference lines and level marks put on them, which relate to the imaginary plane in which they are being framed. In the case of a primary timber these lines and marks need to relate to two imaginary planes, as these timbers will be common to more than one two-dimensional layout. This referencing is critical if the frame is to be made accurately in three dimensions. Take a jowl post in a cross-frame layout for instance; once it has been faced, two origin points can be marked on. 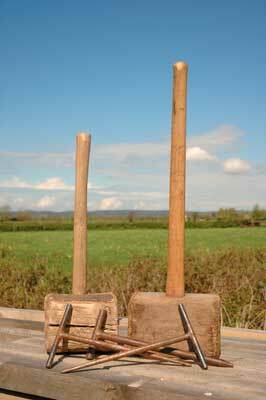 These would be the position that the planes of the top of the wallplate and the bottom of the soleplate would make as they pass through the jowl post. At a point roughly between these marks, a small level is placed on top, perpendicular to the length. If the jowl post is cupped at that point, a little area can be planed flat so the level doesn't rock. A pencil line or a scratch mark is drawn on either side of the level, and a cross is drawn in the middle. This is called the level mark, examples of which have been found on many medieval frames. In this case, the level mark will be parallel to the plane through the cross frame. When the level mark is placed halfway along a beam it has the effect of evening out any twist at the ends. In the case of a twisted jowl post though, it is more useful to put the level mark near the flared end where the head of the jowl connects to the tie beam at its widest point, so it aligns more closely. The twist will be more pronounced at the bottom of the jowl post but it is less noticeable. Apart from the level mark, two chalk lines need to be snapped: one down the face side, and one down the face edge. These chalk lines visually represent the imaginary planes through the cross frame and the wall plane, only set back a parallel amount from the origin point. These enable it to be laid out accurately, even though it may be quite bowed. Taking the jowl post as an example again, a 25mm mark is drawn on both sides of the corner between the face side and the face edge side, at the origin points - the top of the wallplate mark and the bottom of the soleplate mark. Two chalk lines are then snapped between these points. They could be placed 50mm down, or even on the centreline of the jowl, if that makes it more convenient to mark the joints. These reference lines are usually only chalked on the primary timbers. On some it is useful to chalk more than two, for instance a tie beam needs to be referenced to its lower edge, even though it is faced towards its top edge. This is because tie beams are faced to indicate the direction of bend not the working plane - bends should always point upwards in horizontal beams. The next stage of the operation is to lay out one complete plane, such as the wall frame, so that it can be scribed. The order in which the lay-ups are constructed is always much debated. Some framers believe that it is better to set the soleplates out first, as they set out the overall dimensions of the building, whilst others believe it is better to do the cross frames first or even the wall frames. 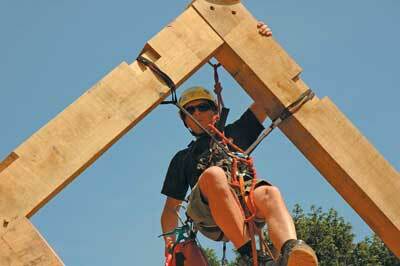 The decision usually comes down to the practicalities of moving timber around, and which pieces are most accessible! To produce a lay-up the timbers are accurately stacked on top of each other, so that the joints can be marked on by transferring the irregular profiles of the lower one onto the upper one, and vice versa. 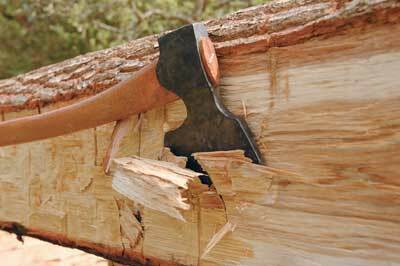 The timbers can be stacked several layers high, so many pieces can be scribed in one go. 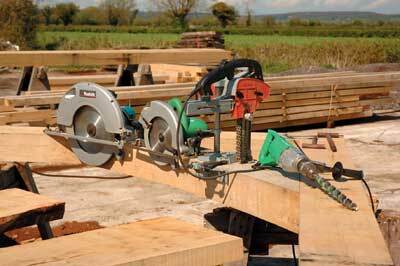 There are two common methods for positioning the timbers in the correct place. The first one, called 'lofting', involves drawing a layout full size on the floor, if it is clean enough! If it is not possible because the surface is rough or uneven, boards can be fixed to the ground so origin points can be marked on them. 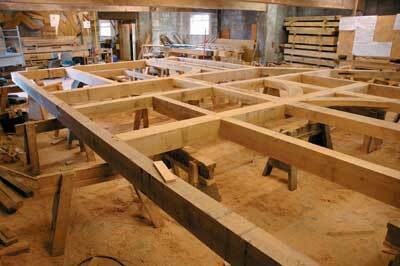 The first set of timbers, usually the largest, are then placed over the lofted drawing and levelled along the reference lines, across the level mark, and also in relation to each other. This is done by packing and wedging the individual timbers up, on blocks off the floor. Their position is then checked very carefully, by transferring origin points marked on the lofted drawing to the corresponding timber by using a plumb line. Once the position of the first set of primary timbers has been established, the position of the second set - those that will joint into the first set - is marked on. The second set can then be laid above the first set, and then packed so that they can be scribed accurately. Lofting an accurate drawing on the floor takes time to do, and laying out the timbers above it is not straightforward and is also time consuming. Lofting comes into its own when repetitive frames need to be made, especially if they are complicated or use very curved timber. 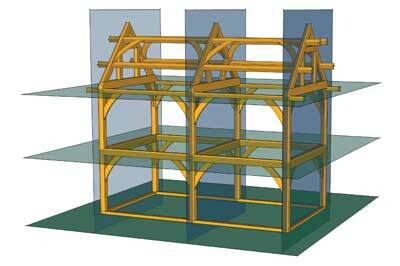 The second, more common method of frame layout, is to do it by setting out the timbers by measurement. Taking the cross-frame layout as an example again, firstly, jowl posts are placed roughly in position, with the face uppermost and levelled. Reference marks need to be put on each one, which will not be lost by the cutting of any joints. Typically a 300mm reference mark is placed below the top of the wallplate mark and above the bottom of the soleplate mark, on the chalked reference line. 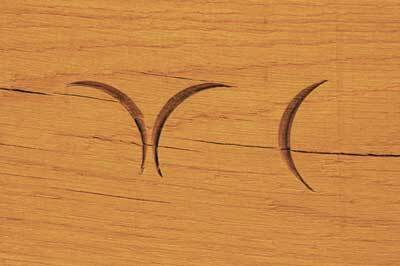 These are done because the original marks will be lost when the joints are cut in the ends of the jowl posts. The jowl posts are then moved until they are parallel to each other and the correct distance apart, using the reference lines, so there are no discrepancies from any deflections. Next they need to be squared, which is done by checking the diagonal measurement between the origin points, and making any adjustments where necessary. Working from the plans, the position of the next set of timbers, which will be laid on the jowl posts, can be marked on. As with lofting, the second set of timbers are carefully placed upon the first set - the jowl posts in this case - on the correct joint positions. For the floor beam that lays across the middle of the jowl posts a different approach needs to be taken. This is because the bows in the middle of the frame can be much more extreme than those at the ends near the origin points. If the floor beam is scribed when level but finishes in a frame out of level, because of the bow, the shoulders of the joint will be wrong. By packing each end to the same height, a vertical drop scribe can be done, whereby each end falls by the same distance to its final position, regardless of its longitudinal level. Laying out frames by either method takes a lot of practice to do well and mistakes are easy to make if care and attention are not taken. The carpenter needs to have a clear picture in his or her mind of how all the components in the frame are interacting, and the ability to think in three dimensions is essential. 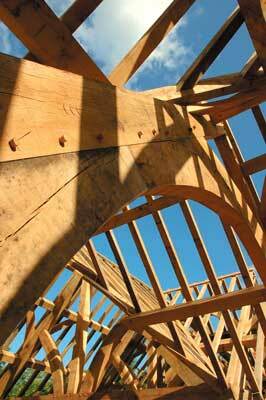 As each timber in the frame has been scribed individually, its position is unique and not interchangeable. Therefore it has to have an exclusive number or 'carpenters' mark' to distinguish it. The numbers are historically based on the Roman numerals, probably because of the ease of chiselling them in. There is no set way of doing these marks, so individual groups of framers tend to develop their own system.